Crafts with baby food jars are always sought after by creative mamas with too many adorable little glass jars on their hands. This simple project uses etching cream to permanently etch the glass. Transform your jars into labeled spice containers as shown or get fancy with your etch designs and create a pretty tealight candle holder! These also could be used as unique gift packaging if you etched the recipient's name on them or the occasion. The perfect size to hold something small like jewelry, paperclips, safety pins, baby hair clips or an ornament. 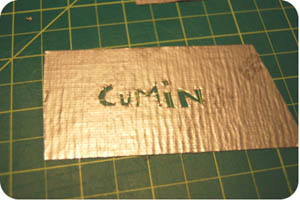 You will need masking tape, self-healing cutting mat, an x-acto knife, etch cream (I use Armour Etch) and a faucet to rinse. Etch cream is nasty stuff, be sure to keep this away from children. This is not a product to mess around with! If it burns glass imagine what it can do to your skin. I wear gloves when using it as added protection and be sure to use proper ventilation too. Okay, if you haven't been scared off by now (really, this is fun!) keep on going. Place a strip of duct tape on your mat and cut out your design. You can skip this step entirely if you purchase peel away etching stencils. Then carefully pull up your duct tape and place on your jar. Now paint on your etching cream. The instructions usually say 2-3 minutes if I remember correctly, but I've found the best results leaving them on for about ten minutes. 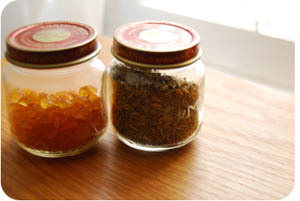 Different jars may react differently though so when in doubt, follow the package directions. 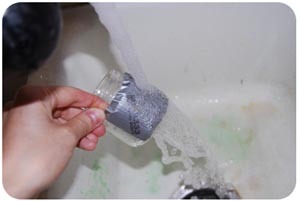 Rinse your jar under cold tap water very well and then peel off your tape to reveal your design! Don't these make lovely little spice jars? You'll notice I didn't paint the lids on these, but I did on the ones I gave as gifts which I accidentally forgot to photograph before they left my house. Your best bet is an enamel paint...nail polish worked well for me. Another option is to print up circle labels for the tops out of sticker paper. 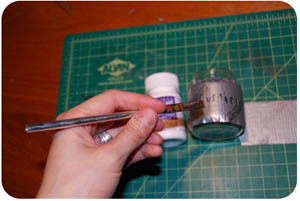 Enjoy this etching crafts with baby food jars project! Go to the Baby Food Jar Crafts Section for more project ideas! Back to the top of the Etching Crafts with Baby Food Jars page.